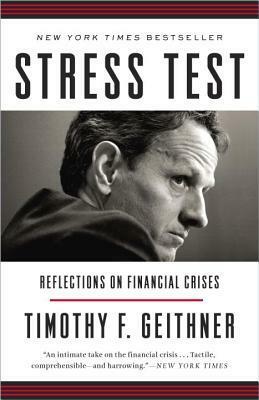 I found it difficult not to admire Secretary Geithner after reading Stress Test. He’s colorful, pragmatic, a realist who focuses on substance over optics. He’s clearly a bright guy, rising fast in the world of finance despite a lack of formal education in the subject. He’s also a great teacher, “marinating” the reader in economic terminology (one of many Geithnerisms). Yet his most endearing quality is his spirit for public service. He was one of the “first responders” to the Great Recession, and I believe that his efforts and the efforts of others helped to dampen the effects of the crisis. While it’s difficult to imagine how much worse off we would’ve been, we owe it to ourselves to at least suspend our populist outrage over the Wall St. bailouts and take a serious look at the crisis and its aftermath as this could most certainly happen again in our lifetime. The Great Recession wiped away nearly $15 trillion in household wealth. Unemployment peaked at 10%, and we’re still feeling the effects today. And yet most people ask, why didn’t anyone go to jail? Because this was ultimately a crisis of imagination. No one imagined in 2007 that housing prices would crater. No one foresaw how the complicated derivatives market would unwind and go beyond investment banks to affect other large financial institutions and insurers. No one anticipated the need to keep capital reserves, opting instead for high amounts of leverage and short-term, runnable funding. This was an insanely complex crisis that is still being debated and studied today, almost a decade later. It’s clear that its causes were too complex to assign blame to a few bad actors. Given this complexity, it’s not surprising that the average person doesn’t appreciate the work that government officials like Geithner, Ben Bernake and Hank Paulson did to prevent an economic collapse. This, too, is another failure of imagination. While it’s reasonable to object to certain aspects of the response, like the failures of Lehman and Washington Mutual, it’s difficult to argue that these individuals didn’t act in good faith to resuscitate an economy that was on life support. It’s equally tough to question their credentials, as Geithner spent most of his career at the IMF helping countries deal with crises, and Bernake’s academic career focused on the Great Depression. I suspect that economics itself is partly to blame, as it’s difficult to see the real-time effect of policy until months or even years after the fact. Yet despite these ambiguities, we have concrete evidence that the response was mostly positive. Most of the bailouts have been repaid with a profit to the taxpayer. We can see from the recent economic troubles in Europe that punitive haircuts and excessive austerity, things Geithner fought against and successfully avoided, has led to unnecessary economic stagnation in the Eurozone. The stock market has returned to pre-crisis levels, and then some. The financial system is now stronger after the increased capital requirements of the stress tests and the creation of programs like the Consumer Financial Protection Bureau which help to restore fairness to the markets. Whatever your opinion of these officials, it’s clear that the country is in a better place than it was in 2007, and we’re better prepared for the next crisis. Unfortunately, these public figures have been mostly vilified for their efforts, accused of saving the arsonists on Wall St. while ignoring the common people on Main St. That’s the reality of a crisis. Systemically important institutions had to be saved to protect the whole system. And that’s certainly a thankless task, to do something you know is right when it’s unpopular. But history will be the ultimate judge, and I think it will ultimately look kindly on the efforts of these individuals. I was very inspired reading Geithner’s first-hand account of the response to the Great Recession. His story highlights the importance of public service, and shows how a “small group of thoughtful, dedicated citizens can change the world” 1. I for one think they did, and for the better.